FILE - Pakistani officials investigate the site of bombing at Chaman, border post on the Pakistan Afghanistan border in Pakistan, Nov. 21, 2016. A suspected suicide blast in southwestern Pakistan Monday killed a district police chief along with his security guard and a civilian passerby. 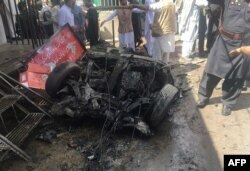 The Pakistani Taliban swiftly claimed responsibly for the attack in the town of Chaman near the Afghan border, saying the bomber was one of its members. The slain police chief, Sajid Khan Mohmand, was traveling to his office and a traffic jam had slowed his vehicle on a busy narrow road when a suicide bomber riding a motorbike struck it, said eyewitnesses. Authorities have retrieved body parts of the suspected attacker from the site but have not yet made a final determination on the nature of the attack. “An investigation is underway but most probably it was a suicide attack,” said area assistant commissioner Kashif Bukhari. He confirmed that police personnel and passers-by were also among at least a dozen people wounded in the attack. The violence came hours after a roadside improvised explosive device hit a security convoy in northwestern semi-autonomous Kurram tribal district, killing at least two paramilitary soldiers. The Pakistani Taliban also took credit for plotting that attack, and claimed it killed seven security personnel, though the militants often issue inflated casualty tolls. Kurram is also located on the Afghan border and has often suffered militant attacks. A twin bombing of a crowded market place last month in Parachinar, the central town of Kurram, killed more than 70 people and wounded scores of others. The victims were mostly members of the minority Shi’ite Muslim community. FILE - Pakistani security officials and residents gather at the site of a powerful explosion at a market in Parachinar, capital of the Kurram tribal district, on March 31, 2017. A bomb explosion in January and a suicide car bombing in March in the city claimed lives of at least 50 people, mostly Shi’ites. Militant violence has spiked in Pakistan in recent months despite official claims of dismantling bases of the Pakistani Taliban and killing thousands of its militants. Pakistani authorities allege terrorists fleeing security operations have taken refuge in volatile border regions of Afghanistan and orchestrate the violence from there, charges the neighboring country rejects. Is So-called Islamic State Gaining Strength in Pakistan?